Initially, I had not planned to submit for this week’s Photo Friday because time did not permit me to take a picture of an old vehicle. Additionally, I did not have any photos that I had previously taken. But the rules were adjusted somewhat this week, whereas we can submit pics that we did not take. 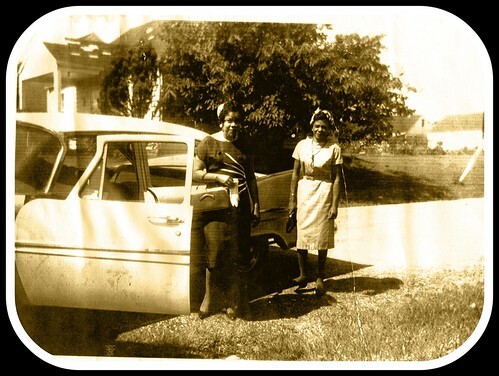 So I thought I’d share a picture taken in the early 60’s of my mother and aunt Anna. Both have gone on to another realm; bless their souls. Sunday afternoons after church in the 60’s were so full of neighborhood and family values: Families and friends gathering together for Soul Food, good conversation–everyone wearing their Sunday best – so full of love and tradition. Boy do I ever miss those days. I myself often carry out the Sunday tradition; but unlike the days of old, it’s always me doing all the cooking and most of us did not come from church! Wow do I miss the days when many of the women gathered in the steamy kitchen talking trash, laughing – whilst the men, admiring their families, talked “business” in the dining room. Now I know that we’ve progressed so much from the 60’s; but some things, in my opinion, did not promote progress, but a sense of individuality bringing forth separation that saddens me. No longer do I see the community and family unity – everyone’s for self now. This, in my opinion, has caused depression, poverty, violence and a malady of social problems. So today, let’s strive to live that life of the 60’s, and bring family and community together. Oh how I miss the days of old . . .
Have a soul filled Sunday! I didn’t grow up in the 60’s, but I do miss all of the family gatherings my family used to have…now it’s just my mom, brother’s and our families…We used to gather at my grandma’s house for birthdays, holidays, or just for the fun of it and now getting the entire family together is so hard. Everyone is too busy and if they are invited they don’t show up or take the time to call and let us know they are not coming. It is so sad, but we just go on making our own memories. Oh How I love this PHOTO!!!! I love old photos like this and I love that we are able to put them on the internet and have them forever!!! Sorry, I’m late seing this but I’ve been away all week. However, it was worth waiting for – what a lovely nostalgic photo. I love the poem too. I sadly have to agree that society has changed – and not all for the better. This pic is GREAT and I love the effect of the framing. Your poem is awesome, too. You are so talented.